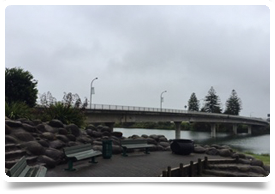 In this blog Debbie continues to share her experience of travelling around New Zealand. 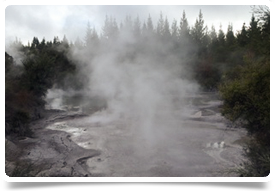 Part three sees Debbie and Nicky visiting clients and candidates in Taupo and Wairoa and discovering the otherworldly Waiotapu geothermal pools. This was to be the day that would see us spend most of it in the car. The first leg of our journey would take us just over an hour so it was an early start with a take away coffee for us. 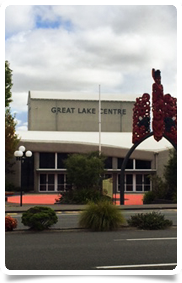 We bid a fond farewell to Rotorua and headed down Highway 5 to Taupo. As we drove I was again captivated by the rolling landscape unfolding in front of me. 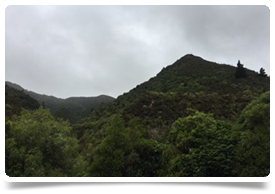 The closer we got to Taupo, the more visible the natural hot springs were, with steam rising up above trees. We made a short detour to Waiotapu to see the geothermal mud pools. Unfortunately we only had time for a quick look and a couple of photos before jumping back in the car. 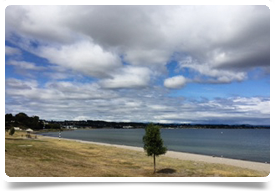 We arrived in Taupo, parked the car and walked the short distance to our first appointment of the day. We were meeting with one of the clients I have been working closely with over the last few months. The practice was in the middle of major renovations which were visible but seemed to have no impact on how efficiently the practice was running. From there we went next door to another practice that we have worked with. It was lovely to catch up with one of our placed doctors there. She told us that she has fallen in love with Taupo and decided to stay permanently. Back in the car for a three hour drive on the next leg of our journey. New Zealand is like the gift that just keeps giving. Eager to see what our next destination would have to offer, we made our way along the Thermal Explorer Highway. 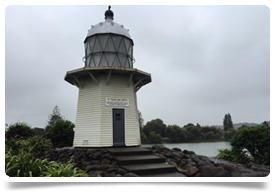 Wairoa is a rural town which sits half way in between Gisborne and Napier. We headed straight to the local hospital to meet with one of our clients and one of our GP’s who had recently taken up a position there. It was lovely to hear how well our candidate has settled in and how much of a positive impact she has made in enhancing the patient experience. It was great to be shown around the Practice, which is situated within the hospital, and to see how the practice and the hospital work together. There is a real presence and celebration of the Maori culture and values throughout the hospital. The main waiting area and corridors are decorated with a wide array of Maori tapestries, paintings and wooden carvings. From there it was back in the car for our final hour-and-a-half drive. Napier was to be our home for the evening.